Wind Over Water: An Untapped Power Source? As a kid, there were few things more satisfying to me that being given a helium balloon... and then almost immediately letting it go for the pure enjoyment of seeing it float out of sight into the sky. For some reason, seeing a small balloon set against a vast blue background gave me a small sense of power simply from knowing that I was the one that put it up there. A silly grin would spread across my face as I stared at the small dot in the sky, knowing that only a minute earlier I held that very same balloon in my own little hand. I felt like a small part of me was launched along with it, and had just started off on a grand adventure. Since I was never able to actually go along for the ride, it was up to the limits of my imagination to envision where the balloon would land. Somewhere around the age of 12, I decided to see if I could actually get any feedback regarding where my balloons ended up. I started to attach little notes to them before I set them free – small notes (so as not to add to much weight) which essentially said, “If you find this balloon, please write me back to let me know where it landed. Thanks!” And then I added my mailing address so they could contact me. The word “popped” was written in big, bold, capital letters – with little lines radiating from it to give the impression that the word itself was popping from the page. It was written in crayon, but whoever wrote it had pretty good penmanship. And the most amazing thing was, they were from Portland, Oregon. Portland, Oregon? My balloon floated almost a thousand miles from Buena Park, CA to Portland, OR? I was amazed. My expectations were more along the lines of it getting tangled around a telephone pole in Anaheim – but it crossed a state line? Fantastic. Now, I had no way to verify this. I certainly didn’t have a FedEx tracking number, and this was way before the days of GPS. I very well could have been duped by a well-meaning neighbor, or even my mother who was probably tired of seeing disappointment on my face all those days when no word arrived in the mail. Yet the way the discovery was described in such detail, with so much emphasis on the unexpected burst of the balloon during its extraction – I was convinced the note and the information it contained was authentic. It was the only response I ever received from one of my balloons, but it was such a great success story that it made the entire experiment worthwhile. I don’t know the likelihood of a standard-sized latex balloon catching just the right stream of air to lift it from southern CA and dump it in northern OR – but I do know some pretty fantastic streams of air do exist. Modern technology caught a glimpse of one just last week. This one occurred far from the western United States. Instead it originated over the Sahara Desert, and all of the sand and dust it picked up from that vast desert is what made it visible from space. The picture below shows the well-defined plume of dust, stretching from Africa’s Sahara Desert, across the entire Atlantic Ocean, and reaching the Lesser Antilles Islands on the eastern edge of the Caribbean Sea. This phenomenal event was captured on June 24, 2009 by the Moderate Resolution Imaging Spectroradiometer (MODIS) on NASA’s Terra satellite. What may be even more amazing is these types of spectacular dust storms are not uncommon. Saharan dust often travels across the Atlantic thanks to a hot, dry, dusty layer of air known as the Saharan Air Layer. Extreme daytime heating of the Sahara creates instability in the lowest layer of the atmosphere, lofting dust particles into the air. The dust-laden air layer continues warming as it travels westward across the Sahara. As the Saharan Air Layer moves off the west coast of Africa, it passes over a cooler, wetter layer of air. This temperature inversion (air usually cools with altitude) prevents mixing, enabling the dust layer to travel across the ocean intact. Aside from providing some pretty spectacular images from space, there is hope that winds that continually whip across certain bodies of water might be a potential source of energy. The North Sea is known for its rough waters and the winds that howl across its northern stretches. Although it may not be the perfect environment for a calm leisurely cruise, the unending winds may become the future energy source for the countries that surround this wind-swept body of water. Off of the coast of Scotland, two massive wind turbines have been built to demonstrate how these rough winds can be harnessed for electricity. 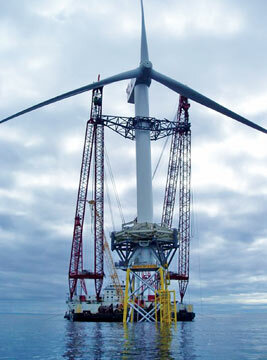 In October of 2007, engineers unveiled the largest wind turbines ever connected to the UK national grid: two massive generators that tower 300ft over the North Sea, 15 miles from the Scottish coast. Both of the devices were erected in water 150 ft deep in the Beatrice oil field. The Beatrice Field is unique because it’s located very close to shore and it’s connected, via buried submarine cables, to the Scottish mainland and the national power grid. When oil production slowed here, it was identified as the perfect location to house this venture into the next generation of energy production. The wind turbines are engineering marvels, each fitted with three 200 ft. blades that can generate 5 megawatts of power – enough to supply a village with electricity. The project, backed by Scottish and Southern Energy and Canadian Oil exploration company Talisman, is the world’s first “deepwater” wind farm and has pushed wind technology to its limits. Designing the huge lattice structures on which the turbines stand, and fastening these to the ocean floor, provided engineers with major headaches that took months to overcome. The turbines themselves are German, but the technology involved in fastening them to the sea bed and making them work in deep water came from Scottish expertise gained from its North Sea oil work. Offshore farms cost more to build, but produce more electricity because they usually stand in open, windier spots. However, current offshore farms can encroach on shipping lanes, affect seabird sanctuaries, and disturb marine life – limiting the number of suitable sites. And windy conditions, no matter how likely, cannot be guaranteed. When the wind is still, so too are the turbines. Opponents of wind power state that such variability of output is the greatest drawback to wind energy. Despite the challenges and uncertainties, the project’s backers say they are preparing to construct 200 of these huge turbines, creating a gigantic wind farm with the capacity to provide power for an entire city. Currently Beatrice has only the 2 operational turbines. It may be the first deepwater wind farm – but it is far from the only offshore wind farm in existence. There are over 25 farms worldwide, the largest being the 194 MW Lynn and Inner Dowsing Wind Farm off the coast of Lincolnshire, England which is comprised of 54 operational turbines. The future of offshore wind farms may be a new concept that takes advantage of the higher winds found in deeper waters, but avoids the increased cost required to secure them to the ocean floor. A research pact between Norwegian energy group Norsk Hydro and German engineering firm Siemens has begun looking to implement a “floating wind-farm” in the North Sea. This will enable the construction of wind turbines far out at sea, out of sight of land, and away from birds' migration routes – but will negate the greatest expense of offshore wind turbines to-date: drilling down to build the structure of the turbines into the sea-bed itself. The design by Norsk Hydro uses a three-cable tethered system, similar to the ones used in oil rigs, that holds a 200 meter tall steel tube with an attached turbine and three 60-meter-long blades. Norsk Hydro expects to be able to use this technology on sites located 50-100 miles off shore, and with a depth of up to 500 meters. Norsk Hydro’s turbine will be the first large scale prototype of its kind, expected to be installed in the North Sea in 2009. If successful, Norsk Hydro expects a full windmill to be operational by 2012. Only time will tell if the investments being made in the North Sea to capture the energy of the wind will provide the next great renewable energy source or not. But as someone that has always been fascinated by the wind’s power and playfulness, I am hopeful that we will someday find a way to cost-effectively harness its potential.